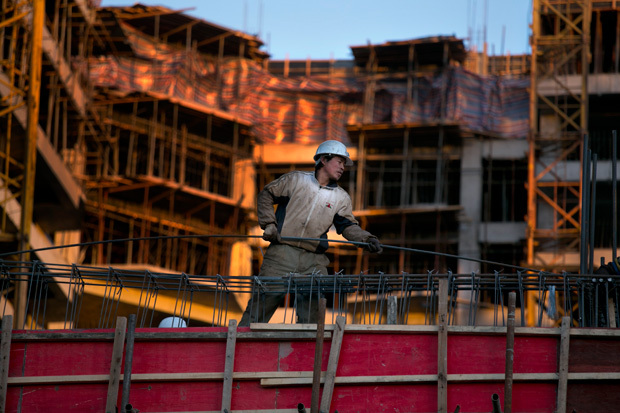 A Chinese construction worker sets rebar on a massive apartment building under construction as a development and a real estate boom takes over in Ulaanbaatar, Mongolia, October 2012. This chapter was first published in Debating China: The U.S.-China Relationship in Ten Conversations, edited by Nina Hachigian. Copyright © 2013. It is reprinted here with the permission of Oxford University Press USA. Framing questions: In what ways do the U.S. and Chinese approaches to development and foreign investment differ? Are they evolving, and how? What are the benefits and drawbacks of each approach both to the investing country and the recipient? In what ways are China and the United States competing in third countries? In what ways are their efforts complementary? Would closer coordination be helpful? Is it possible? What role does “soft power” play? How real is “resource competition?” Is there a “China model” of development? What is the American perspective on China’s relationships with human rights-abusing regimes that provide energy and raw materials? What is the Chinese perspective on America’s investments in the developing world? As you know, the United States and China are constantly in search of common ground—areas where the two countries can cooperate rather than condemn or conflict with each other. Certainly they share broad objectives, for instance, peace and stability in the Asia-Pacific region and free trade. However, they differ often on how best to achieve their common aims. You and I may have the solution in our hands. As China joins the United States as one of the world’s largest sources of foreign direct investment, the two countries have a unique opportunity to help shape the development environment throughout much of the rest of the world. By adopting best practices and learning from each other, Washington and Beijing can contribute to both the economic and social health of the countries in which they invest. This is particularly important in many of the world’s resource-rich countries where hard and soft infrastructure—both buildings and institutional capacity building—still lag behind much of the rest of the international community. Given the size of both the U.S. and Chinese economies and their considerable demands for resources, the two countries bear a special burden to lead. The statistics are staggering. In 2011, China consumed 48% of global zinc supplies, 50% of lead, 50% of copper, and 45% of aluminum.1 All told, mineral imports made up 30% of China’s foreign trade.2 In 2013, China also surpassed the United States as the world’s largest importer of oil. In agricultural products, as well, China is shaping the global market. In 2010, China consumed almost half of all pork, one-third of global rice supplies, and one-quarter of the world’s soybeans. Not surprisingly, as the U.S. economy has moved away from manufacturing toward services and has developed a mature infrastructure, American investment in extractive industries has declined. Still, while the U.S. claim on most resources lags far behind—ranging anywhere from 20 to 25% of Chinese global demand—it is, nonetheless, a top consumer and a significant player in broader issues of global corporate governance, foreign aid, and international security. The threat of global resource competition looms large in the future—particularly as other populous developing countries such as Indonesia and India also seek to develop their economies. However, I am optimistic that innovation, as well as market forces, will meet the world’s future demands. My concern for now is how the United States and China can ensure that their global footprints via their foreign aid and investment practices are positive for the rest of the world. For both countries, getting their investment and aid strategies on track means striking an appropriate balance on two fronts: first, a balance between their economic interests and the development interests of the resource-rich countries in which they invest; and second, a balance between their economic interests and their broader political and strategic aims. Finding this balance is a tall order, and while I don’t think that either the United States or China has yet achieved such an objective, I do think that China will need to travel a greater distance to achieve such a balance. With few exceptions, its multinationals have yet to institutionalize world-class levels of corporate social responsibility and thus can inflict serious damage on the well-being of the communities in which they operate. In addition, Beijing’s willingness to invest without question in countries where the regimes brutally repress their people only deepens and prolongs the suffering of the people in those countries. This is not a sustainable policy for a country with global reach and influence. Of course, China’s extraordinary economic growth and demand for resources have redounded with benefits to the developing world, rejuvenating industries and economies that had been moribund for decades. And its particular mix of state-owned enterprises (SOEs) and government-targeted investment, coupled with private enterprise, makes its model unique. Beijing combines trade, aid, and investment in attractive packages for developing countries. With government political and financial support, for example, Chinese companies often undertake projects that other multinationals consider too risky: investing in, for example, conflict-ridden Sudan, in Zambian copper mines that have not been operational for more than a decade, or in a nickel mine in Papua New Guinea that other multinationals regarded as unprofitable. Beijing also listens to the leaders of the countries in which it does business. It earns diplomatic points for extensive support for infrastructure development, which not only facilitates the ability of Chinese companies to transport their resources but also serves as a critical component of the long-term development of a country. Leaders from Venezuela, Cambodia, and the Democratic Republic of Congo have welcomed Chinese investment and infrastructure as the type of practical assistance they need most. In Ghana, China has provided assistance through grants, interest-free loans, and preferential government loans in a wide range of areas, including hospital buildings, hydropower, telecommunications, irrigation construction, the military, and police barracks. In addition, Chinese experts have offered agricultural, health, and management training. The economic benefit of this broad engagement to Chinese companies is clear: Sino-hydro, for example, is now the world’s largest developer of dams, commanding roughly 70% of all current construction. Yet my sense is that Beijing’s business-at-any-cost strategy will not be viable much longer. It is a short-sighted policy that is detrimental to the long-term health and stability of the countries in which China invests. Increasingly, communities in a number of different countries—including Peru, Papua New Guinea, Vietnam, and Australia, among others—have begun to voice opposition to Chinese investment in their natural resource sectors. Poor environmental, labor, and safety practices have caused intense conflicts with local residents, as has China’s predilection for importing Chinese labor for its massive infrastructure and mining projects. In Peru, for example, the Chinese SOE Shougang Hierro has faced more than five years of protests as a result of a series of measures it adopted: lowering wages, reneging on a plan for local infrastructure and housing, and contaminating local water supplies by pumping waste illegally into the San Nicholas Bay. Evidence of weak corporate social responsibility among Chinese companies is widespread, despite the fact that a number of Chinese government agencies, including China EXIM Bank, the Shanghai Stock Exchange, and the State-Owned Assets Supervision and Administration Commission, have clear guidelines regarding environmental protection, worker safety, and product quality standards. The United States brings a different set of opportunities and challenges to the foreign investment table. There are no state-owned firms, and the U.S. government does not offer the type of comprehensive package of trade, aid, and investment that China does. Certainly, there are mechanisms for supporting U.S. firms through the Overseas Private Investment Corporation (OPIC) or private organizations that promote U.S. trade and investment such as the U.S. Chamber of Commerce, but the U.S. government does not have the capacity to integrate corporations into a broader package of development assistance. Unlike in China, there are few ways in which business objectives are reinforced by a vast array of other investment and assistance tools, and vice versa. Indeed, there are numerous instances in which broader U.S. strategic interests on issues, such as human rights or proliferation, work in opposition to the interests of U.S. firms. Government sanctions on doing business in countries such as Burma/Myanmar, Iran, Sudan, and North Korea have left natural resource and oil companies at a significant disadvantage with their competitors in countries that have not levied such sanctions, including China. On the plus side, schooled in the United States—with an investigative media, strong rule of law, and comparatively more watchdog NGOs—U.S. firms generally bring a reputation for strong corporate governance practices. Most, although certainly not all, American companies have integrated corporate social responsibility guidelines into the fabric of their operations, viewing doing business “the right way” as making reputational sense and essential to profitable business over the long term. In addition, the United States has on its books a Foreign Corrupt Practices Act that promises to penalize any company engaging in extralegal activities abroad, such as bribery. The importance of good governance also commands significant attention in U.S. foreign assistance—both public and private. The United States Agency for International Development (USAID), the chief aid body, states “U.S. foreign assistance has always had the twofold purpose of furthering America’s foreign policy interests in expanding democracy and free markets while improving the lives of citizens in the developing world.”6 Generally, the U.S. government pushes countries to adopt better practices in areas that will also provide a better investment environment for American companies, such as market access, services, and intellectual property rights. In addition, USAID’s priorities include broader issues of governance, such as citizen safety and effective governance, focusing on the links between security, economic prosperity, and strong democratic institutions. The U.S. government’s initiatives on good governance get further support from NGOs such as the Revenue Watch Institute, which focuses explicitly on developing transparency and accountability in the minerals sector. The Institute works with governments to draft mining and oil laws and to improve revenue management, including revenue sharing arrangements among various levels of government. A wealth of NGOs, such as the Gates Foundation, also support soft infrastructure, such as developing and deploying hygienic toilets to help curb the spread of disease or the provision of anti-malaria bed nets. What is largely missing from the U.S. equation is the type of massive infrastructure assistance that China provides as part of its engagement in the developing world. Despite significant rhetorical commitment and boots on the ground, both U.S. companies and U.S. agencies have encountered significant criticism for the nature of their engagement in the developing world. There have been a number of cases of local communities in countries such as Indonesia and Ghana protesting against U.S. companies on environmental grounds. Moreover, many developing countries have accused the United States of tying its aid to particular political allies or using aid as a reward or punishment for governments that do or do not support U.S. interests. Even within the United States, there are accusations that foreign investment contracts—particularly reconstruction contracts—are awarded to firms with political ties to the current party in power. There are lessons for both China and the United States in their foreign investment and assistance efforts. Alongside its traditional preference for supporting governance reforms, the United States should think more about the need for infrastructure assistance to resource-rich developing countries. China, in turn, should place greater emphasis on supporting good governance in the countries in which it does business, along with the strong support it provides for infrastructure and other economic development needs. As Beijing has discovered in Burma/Myanmar and Zambia, working in partnership with poorly governed states can have very negative consequences for Chinese companies when these governments transition. Good governance and strong infrastructure support and sustain each other but suffer without the other. China should also consider developing a foreign corrupt practices act and a more proactive approach to educating its SOEs on corporate social responsibility. Some Chinese firms are already pushing forward on this front, particularly as they seek to access markets in the advanced industrialized countries. Despite the size of their collective footprint, it’s clear that neither the United States nor China has perfected its role as responsible investor and shaper of development in resource-rich developing countries. Each has different strengths and weaknesses. Yet in those differences exists the opportunity to learn each from the other, and we should encourage both countries to do so. Indeed, China and the United States are two important actors in addressing a long list of issues beyond the realm of bilateral interactions. Foreign investment and development aid stand out as issue areas in which collaboration is theoretically feasible. However to translate the ideas that you and I, together with many others in the community of experts on Sino-American relations, believe are worthwhile into concrete action, it is necessary to sort out some of our differences, both factual and perceptual. Let me begin by putting into perspective the role natural resource acquisition plays in China’s foreign investment strategy. Here I limit my discussion to physical extraction operations. Before I begin, I want to remind readers that the international financial market plays a big, but not very visible, role in making new investments in extraction as well as trade of commodities possible. Many of China’s large energy companies, including the well-known China National Petroleum Company (CNPC) and China National Offshore Oil Corporation (CNOOC), are listed in the stock markets beyond China’s own borders. As such, part of their mission is to satisfy demands from a worldwide network of investors, not just China. Many Chinese in government and business circles find it hard to understand the level of Western interest in China’s acquisition of natural resources from developing countries. This trade is a common phase in many countries’ development paths. Until the mid-1990s, China itself earned over half of its foreign currency income through exports of raw materials such as coal, oil, mineral ores, grain, and the like. In particular, from the early 1970s to the late 1990s, China entered into long-term trade agreements with Japan to sell raw materials in exchange for a supply of equipment and machinery. In the 1970s, China also exported oil to the United States. The lesson from China’s history is this: if exporting natural resources is what a country has to rely on for income at a particular stage of development, so be it. Those countries that are supplying China with resources today have the chance to climb the ladder of industrialization in the world economy just as China did. Furthermore, China is a latecomer in the global search for natural resources beyond its borders. Companies from Europe, North America, and Japan have the advantage of having won global access to oil, minerals, and other commodities for their domestic consumption much earlier. They dominate world trade in commodities and have established rules and norms for new entrants to follow. When China entered the global competition, alas, only “left over” assets remained in difficult geological and geographical terrains and in politically unstable countries. Because of the time when it entered the global history of natural resource extraction, China has had little choice but to pursue relationships with resource-rich but politically unsavory countries in Africa and Latin America, and among its Asian neighbors. My point here is not about any one case. In fact, part of the problem is confusion about the entire spectrum of Chinese and other international investments in one particular developing country. Many developing countries do not have reliable mechanisms for collecting basic data about Chinese and other foreign companies operating in their societies. This leaves room for accounts by advocacy groups that highlight a particular company or a particular case to stand in for the complete picture. Advocacy groups, regardless of their focus on human rights or the environment, do have a role to play. They keep all companies, Chinese and Western, on their toes. At the same time, they tend to dramatize singular failures. When Chinese companies fail to sufficiently engage international NGOs or Western media when controversies arise, they are doing themselves no favors. This leads further to individual cases becoming generalized, which is not conducive to meaningful dialogue. Do Chinese companies willfully disregard norms of corporate social responsibility? The barest minimum indicator of that responsibility is specified in the contracts a foreign company signs upon entry. As you would agree, it takes effective legal and judicial agencies in a recipient country to enforce those contracts. Many Chinese companies err by assuming that the general procedures and attitudes toward foreign direct investment of any developing country are the same as in China. For example, in China, governments at various levels are responsible for dealing with such tasks as resettlement of human inhabitants, when construction of a factory or a mine so requires. Many of the countries Chinese companies operate in do not have even the most rudimentary but essential legal structures like land title in place. Thus, companies may end up trampling on people’s rights without meaning to because they assume the local government will look after the interests of their own citizens. Though certainly not a point of pride, even within China, there have been numerous incidents of resident protests against mining and other industrial operations. Cost cutting is a powerful instinct for a company. The acceptable amount of compensation for resettlement is often a moving target. As such, genuine dialogue about performance in corporate responsibility has to consider a large spectrum of actors and interactions between them. Right here I see an opportunity for cooperation between China and the United States. As you noted, a number of Chinese government agencies have issued guidelines regarding environmental protection, worker safety, and product quality standards for companies to observe, both at home and abroad. But these guidelines are not enough, as reports of troubling incidents (however isolated they are) remind us. Interested parties in the United States can be more productive by joining hands with Chinese companies to agree to abide by developing country specific and industry-specific codes of conduct. Such Sino-American cooperation would also involve the host government of an investment project. With the host government being on board from the start, we stand a better chance of avoiding a situation of a company claiming that whatever it is doing is in line with unspecified “best practice” norms. Last but not least, it would help win more hearts and minds among Chinese skeptical about American and other Western criticism if those critics could show more understanding of the role China’s foreign energy and mineral acquisition plays in the global process of production. China imports raw materials such as mineral ores, does the preliminary processing in China (and keeps the environmental side effects there, too), exports semifinished products to countries with more sophisticated manufacturing facilities and know-how, and reimports the finished products.8 Indeed, Chinese energy policymakers often note that 28% of China’s energy goes into making products for export, while the country is 85% self-reliant in terms of total energy supply. That makes China a net energy exporting country, in actuality. I can easily imagine that such Chinese sentiments may not easily win sympathy from the West. Western as well as Chinese academics and policy makers have repeatedly warned China against the practice of putting fast growth ahead of adopting the most energy-efficient equipment and industrial methods available in the world. There is a legitimate point that China has put itself in the position of having to rely on ever-increasing amounts of energy from abroad due to the failure of faster and more energy-efficient industrial innovation at home. Yet, there is no meaningful competition for a high moral ground here. We are all part of the global chain of industrial production. Products have to be made somewhere in order to meet daily needs around the world. There is not that much we can do other than working to make each stage of the process more resource efficient. Speaking about efficiency in energy and natural resource use, China and the United States have a record of cooperation worth celebrating. Beginning with the Carter administration, the United States has made energy and, more broadly, industrial efficiency a prominent area for cooperation with China. Chinese scientists work with their American peers to propose concrete projects, endorsed by their respective host institutions, and eventually have their governments provide the policy support. In the area of energy alone, over the past 30 years, more than 30 government-to-government agreements were signed, resulting in over 30,000 collaborations. Such cooperation not only benefits the two sides involved, but Chinese companies are able to practice more efficient production in third countries with the better equipment and enhanced know-how gained from interactions with Americans. Now let me turn to the issue of development aid. This is a contentious topic between China and the United States. Since the Kissinger-Nixon détente with China in 1971, the United States has not made development aid an underpinning instrument for U.S. companies to enter the Chinese market. For the past three decades, the main supplier of bilateral aid to China was Japan, followed by European countries. Of course, the United States did help indirectly. The United States is one of the largest contributors to the World Bank, which has been the single most important multilateral agency to assist in the transformation of the Chinese market, in both policy making and project development. The point here is that there is little history of collaboration between Chinese and American aid policy makers and practitioners through which to develop a common sense of acceptable behaviors, or norms. It is far-fetched to conclude that China uses aid as an instrument to promote a “China model” of development in recipient countries or to enhance China’s “soft power” influence vis-à-vis the United States. China’s aid provision is rooted in its experience in receiving aid from donor states. In the 1950s, the Soviet Union was the single most important provider of development aid to China. As a matter of fact, China’s first five-year economic plan, especially the industrial component therein, was almost entirely based on provision of monetary, equipment, and human-resource aid from the Soviet Union. In exchange, the Soviet Union demanded that China adhere to its preferences in every aspect of domestic and international policy. The political burden of relying on Soviet aid was so heavy that China opted to allow a break-up of its alliance with the Soviet Union in 1960, including offering to repay Soviet aid ahead of schedule. As such, China chose to relate to countries that receive its aid by doing the opposite of what the Soviet model mandated. Today China de-links its aid provision from such political issues as a recipient country’s human rights reputation, to try to prevent a similar backlash to what the Soviets experienced with China. Furthermore, tying aid to foreign company entry is a feature of development aid that China has itself experienced since the early 1970s. The unspoken logic is that if the approach worked out well with China, it should also work when the time comes for China to be a donor. China’s development aid has generated controversy on the domestic front as well. For example, in late 2011, when the domestic media reported that China had donated three dozen school buses to Macedonia, a public uproar erupted over the lack of safe school buses provided to Chinese children. The National People’s Congress jumped on the bandwagon of public dissent by holding a public hearing on school bus safety. China’s development aid, understandably, is partly designed to foster political goodwill in developing countries when it comes to such matters as UN deliberations regarding human rights in China, and long-running contentious issues like Taiwan, Tibet, and Xinjiang. The area where Chinese and American approaches do differ is whether or not aid dispersal must be preconditioned upon regime change or improvements in human rights certified by the outside world. Those differences are unlikely to narrow in the foreseeable future. Meanwhile, there is no reason to despair. In countries from Myanmar to Zambia to Venezuela, the American approach contributes to improving soft (political) infrastructure, while the Chinese approach contributes to improving hard (economic) infrastructure. These two approaches reinforce one another. A more transparent and stable host government in the developing world is conducive to protecting China’s investment interests. The other side of the coin is that with a vibrant economy, which foreign investments from countries like China help create, democratic change has a better chance to sustain its momentum. At the end of the day, however, positive change has to come from within. When I bring my observations together, there is clearly a rationale for consultation and collaboration between China and the United States when it comes to development assistance. Mechanisms like the U.S.–China consultation on the Asia-Pacific region, held at the assistant ministerial level between the U.S. State Department and the Chinese Foreign Ministry, are a step in the right direction. Collaboration is important because the nature of the interaction between China and the United States is increasingly consequential for those countries under discussion. When experts like you and me help to socialize larger communities of stakeholders in development and aid in both of our countries to better appreciate each other’s positions, our two countries also stand a greater chance of making third-country issues less contentious in our bilateral ties. Your thoughtful commentary has prompted me to look anew at some of the issues surrounding China’s resource acquisition strategy and its broader implications. In some ways, we occupy common ground; in others, our differences now seem more pronounced. In either case, I hope you agree that greater communication and clarity only open the door to more fruitful cooperation down the line. One question your essay raises is how China’s behavior compares to that of other countries. You express surprise on behalf of many in China that the rest of the world is so interested in China’s resource acquisition strategy. You note that China is simply moving up the economic value chain from resource exporter to resource importer, as many countries have done previously; and, you argue China’s willingness to do business in politically unsavory countries is a function of its latecomer status. I think, however, that the world’s interest in China’s global investment and aid strategy is easily understood. First, in terms of the sheer level of consumption of global resources, as I mentioned in our first exchange, China today matters more than any other country. While I don’t believe that the scale of Chinese resource consumption, itself, poses a problem, it certainly reinforces the importance of China: either through direct investment in mines, land, or oil and gas fields or through trading on the global market, China has a profound impact on the global investment in and supply of commodities. Moreover, while it is true that in the late 1990s-early 2000s in the initial stage of China’s going out strategy, in which the Chinese government formally encouraged its enterprises to seek investment opportunities overseas, the country’s opportunities were overwhelmingly in places where no one else wanted to (or legally could) do business, that is no longer the case. Chinese companies are very actively and often successfully bidding top dollar to secure access to resources in places such as Brazil, Australia, and Canada. It is no longer the case that China has “no choice” but to do business with “politically unsavory countries.” It can increasingly afford to relax its prohibition against “mixing business with politics” and think through the broader political ramifications of its investment deals in places such as Iran or Sudan. Second, your discussion of the large Chinese oil and gas companies, such as CNPC and CNOOC, reminded me that not all resource sectors and resource companies are created equal. Different resource sectors are characterized by very different types of actors and market orientations. There are, for example, only a handful of significant players in China’s oil and gas industry, the most important of which are both state-owned and publicly listed. In contrast, there are thousands of actors in China’s mining industry, some of which are state-owned, others that are owned by provincial or local governments, and still others that are privately held with far less government oversight. While there have been some corporate social responsibility problems reported with China’s oil and gas companies (in Gabon, for example), there are many more in the mining sector from all over the world. From the Shougang-owned Marcona mine in Peru to several Chinese-owned mines in Zambia, to the China Metallurgical Group’s Ramu nickel mine in Papua New Guinea, reports of serious violations are commonplace. The decentralized nature of China’s mining industry, as well as the often weak state capacity in the recipient country, provides fertile ground for lax corporate social responsibility. Individual Chinese miners have even struck out on their own: in 2012, Ghana arrested 41 Chinese miners for illegal mining activities, and reportedly there are hundreds more miners operating illegally.9 Thus, when we talk about where the challenges and needs for cooperation are greatest, it is worth thinking through systematically which actors in which sectors are most in need of attention. Third, you explain that some of the difficulties Chinese companies have encountered abroad stem from weak state capacity in the recipient country and from a misunderstanding on the part of the Chinese companies concerning the role of the state in protecting its own people. Most notably, you suggest that Chinese companies believe that it is the job of local governments to protect their people from poor labor and safety practices and to ensure meaningful compensation in cases of relocation. Given the practices of Chinese resource companies at home in terms of labor, safety, and environmental practices—not to mention the problems with mass relocations—it is hard to believe that Chinese companies have learned that the state’s role is to protect the people. In fact, I would suggest that at least with regard to the mining sector, the number of popular protests in China over environmental pollution and health problems, as well as labor and safety violations, suggests that Chinese companies have learned precisely the opposite lesson: they can behave with relative impunity, exporting their practices from home, as long as they are dealing with a weak government. It is easy to place responsibility on the victim in the case of a multinational’s poor corporate social responsibility—particularly when a deal may involve corruption on the part of officials in the recipient country—but over the longer term, as many other countries’ multinationals continue to learn, both the company and host country will pay a steep reputational price. Finally, I would agree with you that China is not seeking to export a China model of development. By virtue of its size, its dynamic and wealthy overseas community, and its political system, the Chinese model is unique and really can’t be exported wholesale. On the other hand, I don’t believe it is “far-fetched” to argue that through its development assistance and its investment decisions, Beijing is in fact seeking to enhance its soft power. In her article, “More Soft Power Needed in Africa,” Chinese Academy of Social Sciences scholar He Wenping noted, “China has long maintained its comparative advantages [with the United States] in its relations with Africa by expanding its investment in the continent and aiding African countries with hard projects such as infrastructure building. As a result, China’s presence on the continent is widely welcomed by the African people. In comparison, western countries such as the U.S. have concentrated their input in soft projects that have produced intangible results . . . . ”10 Again, I don’t think that there is anything untoward about China using all the tools at its disposal—from Confucius Institutes to building the African Union headquarters—to enhance its reputation and influence, particularly in countries in which it would like to do business. However, it is somewhat disingenuous to argue that China’s overall development assistance program is not designed at least in part to accomplish precisely this end. So where does this leave us? I don’t think it leaves us far from where we started, which is to say that both China and the United States need to do more and can do some of it together. First, I appreciate the point that I think underpins much of your argument: we shouldn’t oversell the negative in the case of China, because, as you point out, real data are scarce. For example, you cite a fact provided by Dr. Moyo—that there is one Chinese worker in Zambia for every thirteen Zambians—as evidence that there is no need to be concerned about China importing labor in significant numbers. In fact, when I reviewed her source for that fact, it appeared that the statistic derived from a single case in which there were 62 Chinese managers and 853 Zambian miners at a particular Zambian mine.11 Dr. Moyo’s generalization from this one case seems misguided. I have not found any comprehensive statistics regarding the ratio of Chinese to Zambian workers in the mines, but I would be interested if you have. My sense is that investigating whether—as I think—there is a pattern of poor corporate social responsibility on the part of Chinese mining companies that exceeds that of other multinational mining companies or whether—as you think—these are one-off cases given too much prominence by NGOs, would lead to a determination that both of us are less right than we think we are. A data-gathering exercise would seem a useful collaborative project among the United States, China, and the resource-rich developing countries, perhaps conducted by local NGOs and think tanks. It seems clear that both the United States and China need to be on the same page, assisting in both the physical and political development of the countries from which they derive so much of their resources and their wealth. I hope our exchange is a useful start to more rigorous communication between Chinese and American observers about our respective country’s performance and goals in the areas of resource security and development aid. In the space below, I’d like to offer a couple of clarifications and additional thoughts. My overall conclusion is that Chinese and American resource companies need to collaborate more with each other to enhance corporate social responsibility in developing countries. In the area of development aid, one way to narrow our differences is not to treat aid as an instrument of “soft power” but instead continue to explore ways and means to foster stability though a gradual process of socio-economic transitions of poor developing countries. On resource security, let me just say that the trigger for attention on China, and indeed any major consumer of natural resources ranging from food, to oil, to minerals, is usually an unexpected change in the price of these commodities. When viewed as a market phenomenon, as economists remind us, the law of supply and demand is at work. Chinese resource companies are part of the changing dynamics of a global resource market. They operate overseas, amid controversies, but they enlarge total world supply.13 The resource extractive industry operating in the developing world has been controversial for many decades. Now it’s Chinese companies’ turn to get their share of international attention. The real question is how to make such operations more acceptable to the multitude of stakeholders, rather than focusing most attention on the nationality of company ownership. Outbreaks of disputes in Africa that involve Chinese companies, some of which you rightly mention, not only carry monetary and reputational costs for the companies in question but also run counter to efforts to enhance the image of China and the Chinese people abroad. Events like the evacuation of roughly 40,000 Chinese industrial workers out of Libya in 2011 certainly reinforced a broad awareness in China of political risks that can come from involvement overseas. In that incident, the Chinese government was a loser on the domestic front as well, as many questioned why their compatriots were put in a precarious foreign location in the first place. Managing those risks on the ground is a process of continuous learning, with its predictable pattern of trial and error. Out of self-interest, the Chinese government and Chinese companies take these incidents seriously. So there is no reason to despair over developments thus far. During this process, the community of Chinese and American foreign policy academics can play a role. Though we do not live in the corporate world, we can advocate two agendas that can help bring positive change to performance on the ground. One task is to help publicize practices of corporate social responsibility by American companies in China and Chinese companies in the United States. By so doing, we can help convince Chinese companies—when they go to any third country—to adopt the same standards as American and other foreign companies do in China and they themselves do in the United States. A second agenda is to advocate for collaboration between Chinese and American companies that are investing in the same third country to establish common minimum standards. As a foreign policy matter, China and the United States do differ over whether or not to invest in certain third countries. China has, by and large, adopted a policy of investing in any country that cares to receive an offer, just as China itself has encouraged direct investment from all other countries. The United States is more active in stipulating preconditions for American companies when they seek to invest abroad. Both China and the United States use government agencies such as export and import banks to promote or discourage specific investment proposals from their respective business communities. However, since both countries are member states of the Multilateral Investment Guarantee Agency, which offers political risk insurance to promote investment in underserved markets, as well as similar mechanisms, what China and America can do together is increase their compliance with established international rules and norms. Arguably, the strength of the Chinese approach is that Chinese companies are afforded as wide a range of investment options as possible. Among the drawbacks is that companies can take up projects in societies where they are ill prepared to handle the cultural, legal, and political complexities. Also, those Chinese companies that engage in labor-intensive operations on the ground are by nature prone to local protests when unemployment in a destination country is high and Chinese laborers are brought in—from the companies’ standpoint—to expedite construction. The American approach, on the other hand, can shield American companies from volatile societies and can, the United States hopes, positively influence the evolution of those governments. But the downside can be a diminution in market share, though often temporary. Competition between China and the United States in development need not be destructive nor inevitable. We should remember that a third country will have its own political and economic agendas to pursue. Competition between Beijing and Washington can help enlarge that third country’s set of choices. At the project level, cost-and-benefit considerations of technology and finance are just as decisive as the nationality of a particular company. A Chinese company is competing with an American one only when they are engaged in bidding over the same project. In a broad sense, Chinese companies’ comparative advantage still comes from lower labor costs. Do Chinese and American companies make investment decisions in a particular third country with a focused motivation to compete with each other? It seems unlikely, as each has its own niche. The bilateral issue in question is that the United States disapproves of Chinese companies going into certain countries, and it so happens that many of these countries still rely heavily on the resource sector. China does not heed unilateral sanctions the United States has imposed on countries such as Iran, Sudan, and Myanmar, though it does partake in UN-imposed sanctions at times. But in each of these and other cases, China’s overall approach is to work with international forums and institutions that attempt to induce gradual change in those countries. In a nutshell, the difference between the Chinese and American approaches is over the pace of change, rather than its overall direction. On the utility of sanctions in affecting positive change in a developing country, in no small part because China was on the receiving end of Western sanctions in the 1950s to early 1970s, we have to admit that conceptual gaps between China and the United States on this issue will remain wide for some time to come. In looking at the impact of third and developing countries on relations between China and the United States, we need to be mindful of the narrowness of such notions as “soft power”—investment and aid for the sake of promoting an image—when both countries stand to benefit from stability and prosperity in every country and region. Development is a long process and truly sustainable forces of change are endogenous in those complex societies. Some third countries are quite adept at exercising asymmetric power in relating to big powers, but in the end, there is no such thing in our modern era as one big power “losing” a small country to another. In September 2012, China and New Zealand entered into a partnership to improve water quality in Rarotonga, Cook Islands. The partnership has both Beijing and Wellington contributing funds and focused on delivering tangible benefits to the local community, which in turn will help the Cook Islands’ tourism industry.16 Similar joint efforts between China and the United States would be welcome. At the end of the day, we do agree about the room for improvement in foreign direct investment operations. As I suggested earlier on, in order to make our discussions matter in the real world, we must think of ways to motivate Chinese and American corporations to work with each other on specific projects. International development institutions like the IMF and the World Bank are useful in moving forward the agenda of inclusive growth, but in the end we need to have demonstration projects on the ground. I hope you and I will see some of those soon.